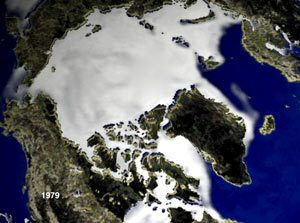 Average arctic ice concentration for March, 1979. Image courtesy of NASA Visible Earth. Many modern scientific expeditions are launched to study the Arctic Ocean. Studies of the geology, biology, chemistry and physical oceanography are on-going, and use ice stations, ice breakers and, more recently, autonomous underwater vehicles. To learn more about these expeditions, go to Woods Hole Oceanographic Institution's Beaufort Gyre Exploration Project.